The phrase “textbook performance” gets thrown around a lot… but this, my friends, is how you work a cow. Reined cow horse is a bit like the eventing of the western world: competitors perform dry work (a reining test), herd work (cutting) and take a cow down the fence. All three phases have their own unique level of excitement, but it’s the cow work that is reined cow horse’s signature event: a horse and rider first box the cow to show control, then make at least two fence turns down the long side of the arena; finally, they circle the cow in each direction. It sounds like a simple test, but as I was told once in a reined cow horse clinic, “you’ve got three brains and eight legs all going full speed, and it gets a little crazy out there.” A good cow run is a true thing of beauty, with the horse and rider in full control of the cow every step of the way. 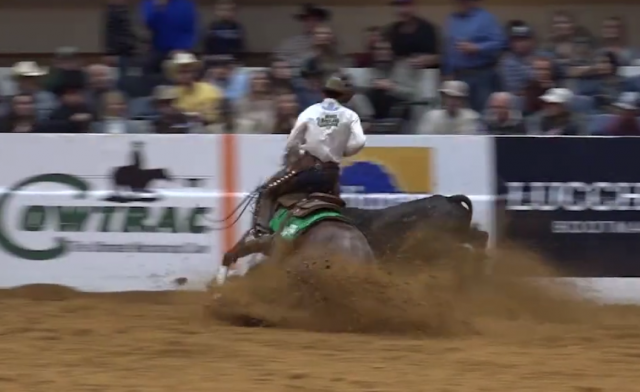 One such run took place at the NRCHA Snaffle Bit Futurity earlier this month: watch Roan Olena Oak piloted by Matt Koch work his way to a score of 224! That couldn’t have gone any smoother if the cow was given the playbook ahead of time. Well done, Roan Olena Oak and Matt Koch!